A novel of our near future, from one of the most popular authors in modern SF. 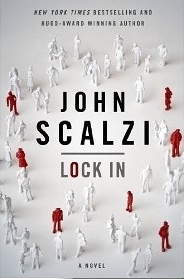 This is the first book by John Scalzi that I have read. Straight after I finished this book, I went and bought two more. I really liked the writing style. This book combines three things I really like in fiction - viruses, cybernetics and neuroscience. Yes I'm weird. This book is set in the future, 20 years after a virus breaks out worldwide causing those infected to either die or develop Haden's Syndrome. While Haden's Syndrome is not a real condition in our world, it was based on the very real condition known as locked-in syndrome in which the sufferer remains consciously aware but the rest of them is paralysed, unresponsive and unable to communicate. It is very rare and very scary. But in this book, it's far from rare with millions of people suffering from Haden's in the US alone. This is the future, so companies funded by the Government have designed threeps, which are Personal Transport devices which I kind of imagined a little like cyborgs that could walk around. This threeps are connected wirelessly to the brains of the Haden's sufferers who are able to remotely control it by thinking so that they can continue to interact with the world and lead a more normal life. We follow Agent Shane, who works for the Police Department's Haden's division (as he himself has Haden's). I have no idea whether this is a guy or a girl as it is not mentioned at all throughout the story. I had guy in my head but it's difficult to tell. This takes skill to pull this off as a writer. I thought there was something missing from the ending. I liked the ending and things were wrapped up nicely but I wasn't completely satisfied. Perhaps it's because it is a stand alone book, maybe I'm getting used to endings which are slightly open ended because they are part of a series. Who knows?! I can't explain it. And because of this, I have given it 4.5 stars instead of 5 stars.